On January 29, 2014 the European COMMISION published the final technical requirements and admininstrative procedures for this regulation. The regulation will go into effect 18-Feb-2016. The purpose of this document is to provide an explanation of the methods and criteria for the application of EASA FTL as amended on 29-Jan-2014. The documentation is provided “AS IS” and is solely intended to provide a general understanding of the author’s interpretation of the new EASA mandated FTL Regulations. to remain in standby mode other than the airport standby. better protection against fatigue transition by extending the period during which the FDP (Flight Duty Period) shall be reduced to 11 hours of hours. 17:00 hrs. 5:00.
an explanation of the rules governing decision making commander’s discretion to reflect the interpretation of OPS 1.1120 by the Air Safety Committee. Moreover, with respect to areas currently regulated at the national level on the basis of the mechanism referred to in Article. 8 paragraph. 4 “EU-OPS”, European Aviation Safety Agency (hereinafter referred to as “the Agency”) proposes the use of the certification specifications referred to in art. Paragraph 22. 2 of the Basic Regulation. However, operators can move away from the use of certification specifications by the introduction of the determination of an individual flight time, provided it has been approved by the Member State and received a positive evaluation of the Agency. The use of certification specifications will not only provide the necessary flexibility, which has already been made under Art. 8 paragraph. 4 “EU-OPS”, but also ensure the creation much more balanced playing field for operators by requiring the Agency to assess any proposed deviations. rules for shortened rest period will guarantee the possibility of eight hours of sleep. the impact of interference on the overall scheduling limitations. means a state in which a crew member’s circadian biological clock is synchronised to the time zone where the crew member is. A crew member is considered to be acclimatised to a 2-hour wide time zone surrounding the local time at the point of departure. 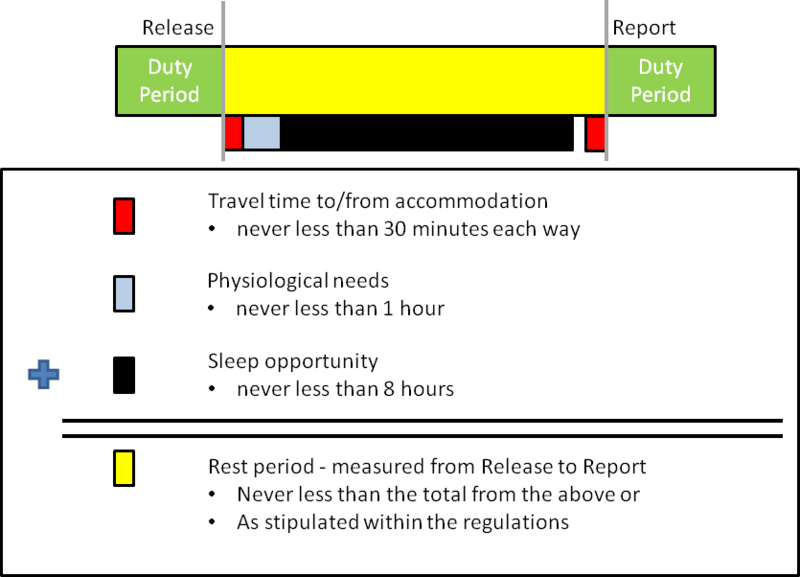 When the local time at the place where a duty commences differs by more than 2 hours from the local time at the place where the next duty starts, the crew member, for the calculation of the maximum daily flight duty period, is considered to be acclimatised in accordance with the values in the Table 1. Means a crew member who is assigned to a duty period, either operating or non-operating. means a crew member assigned to an Standby, Reserve or FDP for duties on the Flight Deck., as a Captain, First Officer, Relief Pilot, Flight Engineer, or Flight Navigator. Daylight saving time (DST) or summer time is the practice of advancing clocks during the lighter months so that evenings have more apparent daylight and mornings have less. Typically clocks are adjusted forward one hour near the start of spring and are adjusted backward in the autumn. fatigue means a physiological state of reduced mental or physical performance capability resulting from sleep loss or extended wakefulness, circadian phase, or workload (mental and/or physical activity) that can impair a crew member’s alertness and ability to safely operate an aircraft or perform safety related duties [as defined by ICAO in the FRMS Manual Doc 9966]. The above additional terms and definitions are used to aid in clarification and understanding of the regulations. Authors note: Airlines should be aware when CM’s will be impacted by a transition between STD and DST. The impact is that the WOCL will not be in synch with definitions of WOCL. The STD/DST transition reduces the window for a LNR, while a DST/STD transition will increase the window for a LNR. 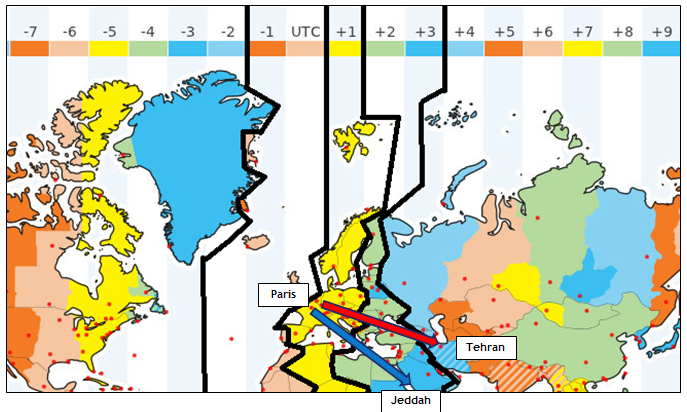 Example: a CM acclimated to Paris (UTC + 1), remains acclimated as long as they remain within the following time zones: UTC -1, UTC, UTC + 1, UTC + 2, UTC + 3 at the conclusion of the duty period.. Jeddah (UTC + 3) is acclimated, while Tehran (UTC + 3:30) will require the crewmember to become acclimated. (D) Acclimated to Departure – occurs when a CM has spent sufficient time within a timezone to become acclimated to the timezone for departure. (B) Acclimated to Previous Acclimated Time Zone – occurs when a CM has spent insufficient time within a timezone to begin the acclimatization process. (X) Unknown – when a CM has entered a new timezone and has begun the acclimatization process but has not spent sufficient time to adjusted to the local timezone. Flying across time zones exposes the circadian body clock to sudden shifts in the day/night cycle. Because of its sensitivity to light and (to a lesser extent) social time cues, the circadian body clock will eventually adapt to a new time zone. Case #1: Since the elapsed time is less than 48:00 (Row 3, Column 1) the crewmember remains acclimated to Paris time (UTC + 1).acclimated. Case #3: Had the departure in Chicago been postponed 60 hours, the elapsed time would be 100:00, the CM has now moved into an acclimated state of acclimatization (Row 3, Column 4). Author’s note: Best practices suggest that operators use the time zone where the CM is currently acclimated to when evaluating under conditions 1 and 4 above. Shall be based upon the OCM’s reference time zone (RTZ). The end of the FDP is at the arrival time of the last operating (working) flight (UTC) before the start of a rest period. Ferry Flights are considered working flights. A rest period begins when a crew member is released from duty until the crew member reports for the next duty. When the airline is responsible to provide a rest accommodation, Travel time to/from the accommodation, Physiological needs and Sleep opportunity must be considered. 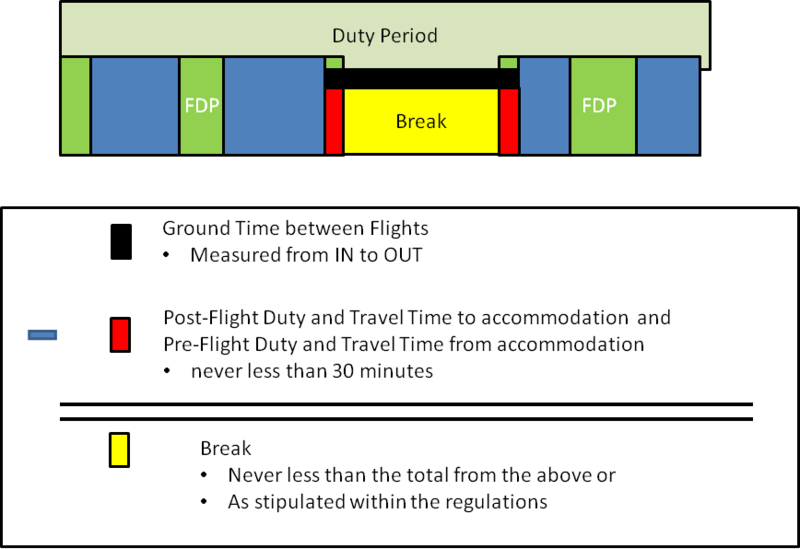 A Break – A break is not considered a Rest Period, it is used to extend FDP limitations using Split Duty rules. The minimum time for a Duty Break is 3 hours. A Break is not considered to be part of a FDP, but it is part of a Duty Period. The operator should specify the times in its Operations Manual (OM) the minimum durations of:. The operator should consider airport, time of day, aircraft type when specifying the minimums above. Example 1 – show a 10 hours rest period from 22:00 to 08:00, this qualifies as a LNR. Example 2 – has a 10 hour rest period with 8 hours during the LNR period from 00:00 to 08:00, the rest from 08:00 to 10:00 is not applied towards the LNR. Example 4 – has a rest period from 01:00 to 06:00 the following day, the rest from 01:00 to 08:00 is not applied towards the LNR since it is insufficient in duration, the rest from 08:00 to 22:00 also is not applied towards the LNR , the rest from 22:00 to 06:00 the next days is applied toward the LNR, it falls within the window and is of sufficient duration. Example 5 – has a rest period from 07:00 to 06:00 the following day, the rest from 07:00 to 08:00 is not applied towards the LNR since it is insufficient in duration, the rest from 08:00 to 22:00 also is not applied towards the LNR , the rest from 22:00 to 06:00 the next days is applied toward the LNR, it falls within the window and is of sufficient duration. Example 6 – has a rest period from 06:00 to 05:00 the following day, the rest from 06:00 to 08:00 is not applied towards the LNR since it is insufficient in duration, the rest from 08:00 to 22:00 also is not applied towards the LNR , the rest from 22:00 to 05:00 the next days is not applied towards the LNR since it is insufficient in duration. Example 7 – has a rest period from 11:00 to 06:00 the following day, the rest from 11:00 to 22:00 is not applied towards the LNR , the rest from 22:00 to 06:00 the next days is applied toward the LNR, it falls within the window and is of sufficient duration. Example 8 – has a rest period from 00:00 to 12:00 the following day, the rest from 00:00 to 08:00 is applied towards the LNR since it is of sufficient in duration, the rest from 08:00 to 22:00 is not applied towards the LNR , the rest from 22:00 to 08:00 the next days is applied toward the LNR, it falls within the window and is of sufficient duration, the rest from 08:00 to 12:00 is not applied toward the LNR. The total amount of rest is 36 hours with 2 LNR‘s. Example 9 – has a rest period from 01:00 to 13:00 the following day, the rest from 01:00 to 08:00 is not applied towards the LNR since it is of insufficient in duration, the rest from 08:00 to 22:00 is not applied towards the LNR , the rest from 22:00 to 08:00 the next days is applied toward the LNR, it falls within the window and is of sufficient duration, the rest from 08:00 to 13:00 is not applied toward the LNR. The total amount of rest is 36 hours with 1 LNR. Authors Note: Best practices suggest that ERRR’s should be given in the home base environment whenever possible. Crew Schemes are also known as crew complements. The positions Captain (CA) and First Officer (FO), refers to individuals who hold the Required Qualifications to Operate in that specific position, versus the Rank of the individual. Individual Airline designations may apply differently. Relief FCM’S are required to meet the appropriate qualifications for the inflight duties to be performed in accordance to ORO.FC.A.201. Augmented Flightcrew must be assigned to an aircraft that has a Class 1, 2 or 3 on-board rest facility. Heavy Flightcrew must be assigned to an aircraft that has a Class 1, 2 or 3 on-board rest facility. Flight operations which operate with the minimum required cabin crew based upon seating capacity and operating requirements. Augmented Cabin crew must be assigned to a FDP scheduled with less than four (4) operational flights. Permits an extension above scheduled FDP limits. May not be combined with Split Duty Extensions. An inflight rest period for each flightcrew member must allow for 90 minutes of rest. Best practices suggest that the inflight rest periods also allow for the impacts of ‘sleep inertia‘, 10-15 minutes. An inflight rest period for the flightcrew members performing the aircraft landing on the last flight in the FDP must allow for two (2) hours of continuous inflight rest. ‘Class 3 rest facility’ means a seat in an aircraft cabin or flight crew compartment that reclines at least 40° from the vertical, provides leg and foot support and is separated from passengers by at least a curtain to provide darkness and some sound mitigation, and is not adjacent to any seat occupied by passengers. Example 1: legal for a 3 pilot flightcrew, complies with the requirement for 2 hrs inflight rest in the FDP and a 90 minute inflight rest for the other pilots, the inflight rest do not overlap. Example 2: legal for a 4 pilot flightcrew only, the inflight rest periods must overlap. Authors Note: The final determination of the minimum inflight rest for the pilot who will be performing monitoring duties on the flight during landing is by the individual regulatory agency, in some cases 1:30 may be permissible, while in other cases, just like the pilot whom will be performing the actual landing, 2:00 may be required. Readers should check with the Airline and or the proper governing agency, for the proper determination concerning minimum inflight rest for these individuals. Night Time is defined as 02:00 and 04:59 in the time zone to which the crewmember is acclimatised. Is a Duty Period which infringes upon any portion of Night Time. Consecutive NDPs are those which occur during the Night Time on consecutive calendar days. Early Time is defined as 05:00 and 05:59 in the time zone to which the crewmember is acclimatised. Early Time is defined as 05:00 and 06:59 in the time zone to which the crewmember is acclimatised. Is a Duty Period which starts (Reports) during the period of Early Time. Late Time is defined as 23:00 and 01:59 in the time zone to which the crewmember is acclimatised. Late Time is defined as 00:00 and 01:59 in the time zone to which the crewmember is acclimatised. Is a Duty Period which ends (Releases) during the period of Late Time. Author’s note: Airlines and Authorising Agencies have the option to determine the type of Disruptive Schedule Scheme to use “Early Type” or “Late Type”. Reference depiction of Local Night / WOCL / Night Duty / Late Finish Duty / Early Start Duty. Is a FDP which contains a Break of at least 3 hours in a ground rest facility. May be applied to a FDP at any time of the day. Break is less than a Required Rest Period. Break is considered FDP as well as Duty. Break requires a Suitable Accommodation if the Break is 6 hours or more, or touches the WOCL. 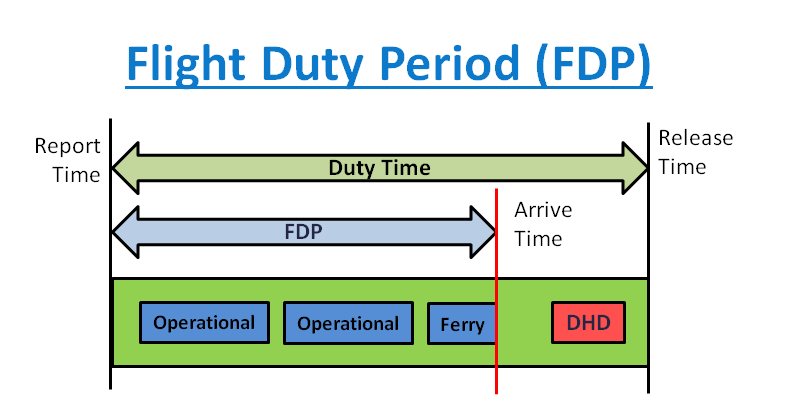 FDP is measured from Report to Arrival of Last Operating Flight. Is only applied to duties that operate under Standard Crew Schemes. Permits extensions above the scheduled FDP limits by 50 % of the break that does not touch the WOCL, when a suitable accommodation is not provided. Permits extensions above the scheduled FDP limits by 50 % the value of the break when a suitable accommodation is provided. All cumulative values are across calendar periods. Only the portion of the Duty Time or Flight Time that falls within calendar day period. Duty time is accumulated across 7, 14 and 28 calendar day periods. Flight Time is accumulated across 28 calendar days, and across 12 calendar months and 1 calendar year.